Nifty is in sell mode in all the timeframes. 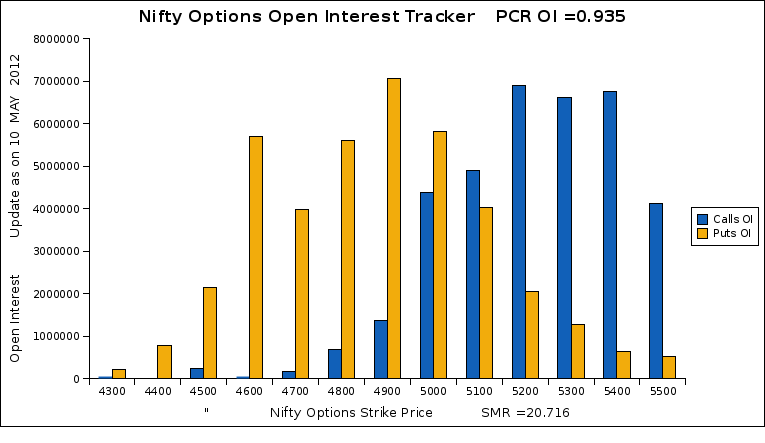 When looking into the open interest details of May 2012 option series we could found that 4900PE has the higher open interest indicating that put writers are confident of holding 4900(support) for the current option series and also 5200CE shows a good amount of open interest builtup and has slightly lesser amount of open interest when compare to 4900PE. Hi Rajandran, total calls open interest is much higher than total puts open interest, I believe nifty is short sell on every bounce.